The KM3NET collaboration brings together many laboratories participating in the experiment, notably the APC (CNRS/Université Paris Diderot/CEA/Observatoire de Paris), the CPPM (CNRS/ Aix-Marseille Université), and the IPHC (CNRS/Université de Strasbourg); UnivEarthS is also participating through the E9 project: Low Energy Astrophysics with KM3NET. 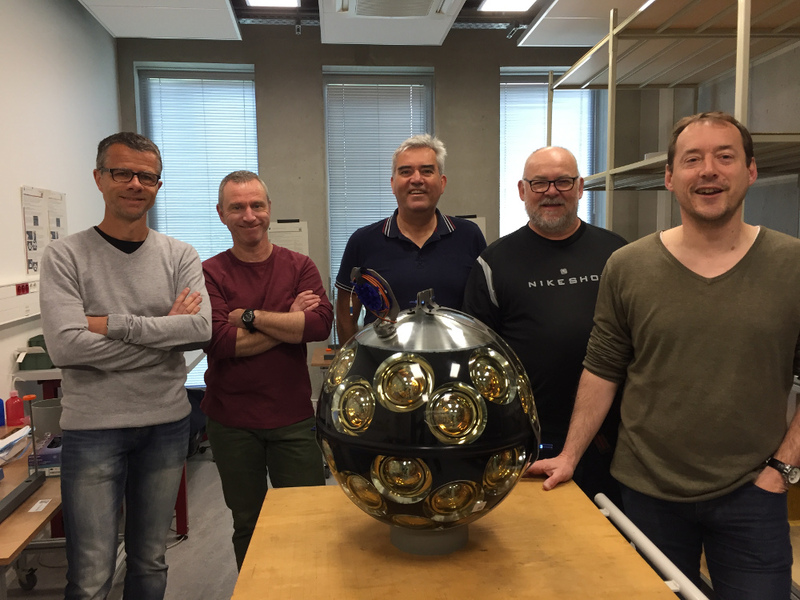 Having joined the collaboration in February 2017, the KM3NeT team of the Neutrino group of the Subatech laboratory (CNRS/University of Nantes/IMT Atlantique) offered to contribute to the construction of the instrument by taking charge of part of the assembly of the optical modules. These are spheres of about fifty centimetres, instrumented with 31 photomultipliers and control and data acquisition systems. These modules are themselves integrated in groups of 18 to form a detection line. The construction and deployment of the 30 lines of phase 1 of the project is currently underway in the Mediterranean. Ultimately, 115 and 330 lines will form the ORCA instruments at a depth of 2,450 metres and ARCA at 3,500 metres respectively, for a total of more than 6,000 optical modules.